Once upon a time, France – along with Italy – had one of the strongest communist parties in Western Europe. The French Communist Party (Parti communiste français, PCF) was – unlike in most other Western countries – the largest party on the left (in terms of popular vote in legislative elections) between 1945 and 1978, although the party’s isolation in the political system after its expulsion from cabinet in May 1947 and the adverse effect of non-proportional electoral systems meant that the party was excluded from governments until 1981 and it had far less seats than the non-communist left in Parliament and local bodies (general and municipal councils) under the Fifth Republic. The party’s support also declined, with more or less consistency, between a post-war peak (28.3% in November 1946) and around 20-22% between 1962 and 1978. The PCF was hurt by the gradual strengthening of the non-communist left in the 1960s and in the 1970s, particularly after the creation of the PS in 1969 and François Mitterrand’s conquest of the new party at the 1971 Épinay Congress on a platform of ‘union of the left’; the Communists also greatly lost in prestige, credibility and image on the left with their steadfastly loyal defence of Moscow’s diktats and actions until the mid-1970s if not later. The PCF made a fatal miscalculation in signing the Common Programme of the left in 1972, pompously assuming that an alliance with the PS would inevitably lead them to power and that, by ‘pushing the PS to the left’, they would gain support at its expense. Instead, the PCF’s support went into a rapid tailspin after 1981, beginning with Georges Marchais’ severe underperformance in the 1981 presidential election (15.4%) and continuing into the 1990s, when the party’s support consistently fell below 10% in most elections. The party was hit by a perfect storm of adverse factors: the shrewdness of François Mitterrand, hellbent on destroying the PCF; the decline and fall of the Soviet Union; the post-Cold War ‘end of history’ discrediting of communism; growing internal divisions and contestation of the PCF by other far-left and left-wing movements; the prolonged economic hardships of the 1980s and the consequent changes to the size, structure and political mindset of the working-class (in addition to generational changes and the decline in post-war class consciousness). Despite attempts at internal democratization and a modernization in the party’s discourse under Robert Hue, the PCF’s leader between 1994 and 2003, the party’s decline was only temporarily halted in the 1990s (8.6% for Hue in 1995, 35 deputies in 1997) but the crisis worsened in the 2000s (3.37% for Hue in 2002, 1.93% for Marie-George Buffet in 2007, down to 15 deputies in 2007). The party struggled to redefine itself as a modernized radical left party. It faced competition from the Greens (a more appealing profile for young educated bobos than the old party of the hammer and sickle), the far-left (a more appealing – and credible – protest vote option for disenchanted working-class voters or young radical leftists). In presidential elections, particularly after the shock of 2002 to the left, its vote was squeezed by pressures for a ‘useful vote’. The Greens outpolled the PCF in the 1994 and 2004 EP elections as well as in the 2002 presidential election, but they lacked the PCF’s strong local government base. The far-left Workers’ Struggle (LO) and Revolutionary Communist League (LCR) outpolled the PCF in both the 2002 and 2007 presidential election, winning over 10% of the vote in 2002. Internally, the party establishment’s strategy was contested on two sides – by the ‘orthodox’ faction (more doctrinaire Marxist-Leninists or anti-reformists) and the refondateurs (the party’s ‘right’, seeking a larger refoundation of the party in an alliance with other parties of the left); the refondateurs, anticipating disaster, refused to support Buffet’s candidacy in 2007, the orthodox were a thorn in the side of the leadership. The PCF retained its rather impressive and resilient network in local governments – ‘municipal communism’ – but it was gradually being chipped away by the PS and the right, and the party became dependent on first round alliances with the PS to win the bulk of its seats on municipal, general and regional councils. Mélenchon, born in Tangiers in 1951 to a pied-noir family (of Spanish and Italian ancestry), is a career politician – he has held elective office since 1983 and has been politically active since he was in high school in 1968. He has a university degree in philosophy and generally lacked stable non-political employment, with stints as a teacher, journalist He was active in student politics in university in Besançon, and joined the Trotskyist (lambertiste) Internationalist Communist Organization (Organisation communiste internationaliste, OCI) in 1972. The lambertiste OCI was a secretive Trotskyist grouping, born from an anti-entryist split in the 1950s, but many future politicians went through the OCI in their youth – like Jean-Christophe Cambadélis, Lionel Jospin and even the former right-wing mayor of Perpignan Jean-Paul Alduy. Mélenchon joined the PS in the Jura in 1976, but recruited by Claude Germon, the PS mayor of Massy (Essonne), he moved to that suburban municipality and was elected municipal councillor in 1983 and general councillor in 1985. He was elected to the Senate in 1986, holding the seat until his election to the European Parliament in 2009. Within the PS, Mélenchon was a mitterrandiste in the 1980s, on the left of the party, opposed to the rocardiens and particularly Prime Minister Michel Rocard’s appointment of centrist ouverture ministers to his government in 1988 (Jean-Pierre Soisson, Michel Durafour etc.). In 1988, he cofounded the Gauche socialiste (Socialist Left, GS), a surprisingly cohesive minority faction on the party’s left which won between 7% and 13% in party congresses. Mélenchon ran for first secretary at the 1997 Brest Congress, the only candidate against François Hollande, supported by the party establishment, and won only 8.8% of the vote, less than what his motion had won (10.2%). Mélenchon claims that Hollande had failed to honour a semi-official gentlemen’s agreement fixing their results – Mélenchon claims he was promised 15% and has said that he will never forgive Hollande for breaking the promise. Although Mélenchon had supported the Maastricht Treaty and the idea of the single currency in 1992, he quickly regretted his choice (particularly about the Euro) and became one of the most ‘rebellious’ members of the PS’ Eurosceptic majority – he was the only Socialist senator to vote against the resolution on the adoption of the Euro and the integration of the Bank of France in the ESCB in 1998 and the ratification of the Treaty of Amsterdam (1999). Between 2000 and 2002, Mélenchon was junior minister for vocational education in the Jospin government. It is the only ministerial office he has held. The GS faction split in 2002, and Mélenchon formed the Nouveau Monde (New World) faction with Henri Emmanuelli and smaller factions; they won 16% at the 2003 Dijon Congress. Mélenchon supported the No and, dissenting from the party’s official position, campaigned for the No. Although both Emmanuelli and Mélenchon supported the No, their faction split following the referendum. Mélenchon created Trait d’union (hyphen) within the PS and a broader transpartisan movement, Pour la République sociale (PRS). After the No’s victory in 2005, Mélenchon’s new project became the construction of a new left-wing, republican, socialist and anti-liberal alliance uniting the PS and the rest of the left – an alliance in which Mélenchon’s faction sought to be the ‘hyphen’ bridging the PS with the radical left. Within the party, Mélenchon faction lent its support to former Prime Minister Laurent Fabius, whose motion won 21% at the 2005 Le Mans Congress and again supported him in the 2006 closed presidential primary, arguing that the party’s presidential candidate should be someone who supported the No in 2005. Mélenchon’s Trait d’union joined the other left-wing factions of the PS (Hamon, Emmanuelli, Lienemann, Filoche) in support a single left-wing motion at the 2008 Reims Congress, led by Benoît Hamon. The motion won 18.5% in the ‘motions vote’ on November 6, finishing fourth. Mélenchon and a smaller faction, Forces militantes, led by Nord deputy Marc Dolez, considered the results a victory for the outgoing majority (divided between the top three motions) and its centrist and ‘social liberal’ inclinations, and took what they judged to be the only logical and principled step – to quit the PS, on November 7. They announced the creation of a new party, the Left Party (Parti de gauche, PG), which sought to emulate Oskar Lafontaine and Germany’s Die Linke, and called for a “front of left-wing forces for the  European elections”, an appeal welcomed by the PCF. In other words, Mélenchon and his new party felt that it was impossible to push the PS to the left from within, and took matters in their own hands by creating a party which hoped to be the foundation for the construction of a left-wing, socialist, Euro-critical and republican alternative on the left of the Socialist Party. The years of being in the minority and of repeated disappointments and defeats explains why the PG is now instinctively hostile to any electoral alliances with the PS. The PG attracted relatively few Socialists besides Mélenchon and Dolez’s supporters – a few elected officials, mostly in Mélenchon’s department (Essonne), and some other left-wing minority groups in the party – although some leftist dissidents of other parties also joined, like Martine Billard (a Green deputy) or Éric Coquerel’s MARS – Gauche républicaine party (founded in 2003/2007 by left-wing dissidents of Jean-Pierre Chevènement’s Republican and Citizen Movement, MRC). The PG defined itself as a left-wing democratic socialist party ultimately seeking the ‘political’ (i.e. democratic) overthrow of the capitalist system; it later also defined itself as an ecosocialist party. In November 2008, the PG and PCF officialized the creation of the Left Front (Front de gauche, FG), an electoral alliance for the 2009 European elections. The FG opposed the ratification of the Lisbon Treaty and all other European treaties, criticizing the neoliberal orientation of the Lisbon Treaty and the EU. The FG coalition was meant to be mutually beneficial to its two main components, the PG and PCF. For the PG, the alliance with the PCF gave it the support of a well-established party with a strong local base, a network of elected officials as well as a fairly large membership (about 69,000 in 2011, compared to no more than 12,000 for the PG at its peak) – all things which the new PG lacked. For the Communists, the alliance with Mélenchon’s PG gave it a new political platform (of which it effectively retained leadership as the largest component) and a new charismatic figure with a far greater popular appeal than the PCF’s uncharismatic apparatchiks. 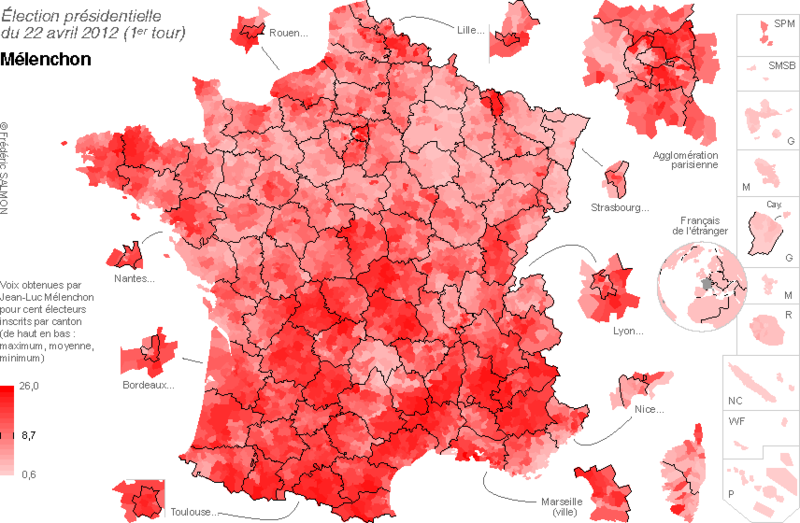 Mélenchon was the FG’s top candidate in the ‘Southwest’ Euroconstituency (despite having never lived in that region). The FG was unable to form an alliance with the far-left LO and New Anticapitalist Party (NPA, successor of the LCR), stuck as always in their narcissism of small differences. Nationally, the FG (with its overseas allies) won 6.48% of the vote and 5 seats, compared to 5.88% and 3 seats for the PCF in 2004. Mélenchon was elected to the European Parliament with 8.2% in the ‘Southwest’ Euroconstituency, the FG’s best result out of the seven metropolitan Euroconstituencies. The FG’s electoral baptism of fire was considered a moderate success, though eclipsed by the Greens. The first tensions between the PCF and PG arose with the 2010 regional elections. French EP elections, the only elections in France held under pure list PR (no majority bonuses, through a higher effective threshold since 2004 with the introduction of smaller regional constituencies) and in a single round, follow the logic of second-order elections like they do elsewhere in Europe – which means, among other things, small parties do well (and more people vote ‘with their middle finger’). Regional elections since 2004 use the two-round system, which for small parties (like the PCF) means that their chances of winning seats on regional councils – and securing representation in regional executives – depend on running independent lists which can pass the 10% threshold to qualify for the runoff (difficult), running independent lists which can pass the 5% threshold to merge with a qualified list for the runoff or outright first round alliances with a larger party by the first round. The PCF had run 8 independent lists out of 22 metropolitan regions in 2004, in other regions it had allied with the PS by the first round – which gave the PCF many regional councillors. Approaching 2010, the PCF was understandably reticent to the idea of independent lists in every region (as the PG wanted) and even more hostile to the possibility of being in opposition to PS regional executives. The PG had nothing to lose, but the PCF – in case things went south – had a lot to lose. Nevertheless, the FG survived and ran independent lists in 17 out 22 metro regions – in three of them, these lists even included the far-left NPA. In the five remaining regions, the local PCF decided to form common lists with the PS by the first round, while the PG in those regions ran its own independent lists – in three of them in alliance with the NPA, in the other two with PCF dissidents. The results were another moderate success for the FG, which on average won 7.5% in those 17 regions where they ran, while the PG on its own on average won under 5% of the vote. The FG, which merged with PS lists in every region where they could (except Limousin, where they remained in the runoff and Picardie), won 100 regional councillors (76 for the PCF, 17 for the PG) – plus 25 won by the PCF in alliance with the PS. In the 2011 cantonal elections, FG candidates won 9% of the vote and 121 seats, compared to 8.8% and 117 seats for the PCF alone in 2008. Mélenchon announced his candidacy for the 2012 presidential election over a year early – in January 2011 and quickly obtained the support of the PG and the FG’s smallest components. Mélenchon and the FG strategy had the support of the PCF’s leadership and the party’s national secretary, Pierre Laurent (elected at the PCF’s 35th congress in 2010), but the party’s orthodox wing – a sizable minority – was suspicious of Mélenchon, fearing that the charismatic tribune only wanted to kill off the PCF and take leadership of the radical left for himself only (others dismissed him as a construction of the medias). Older, more dogmatic communists are also suspicious of Mélenchon because of his background – a former Trotskyist, a student activist leader in 1968-1970s and decades-long Socialist, everything the old PCF would have loathed. 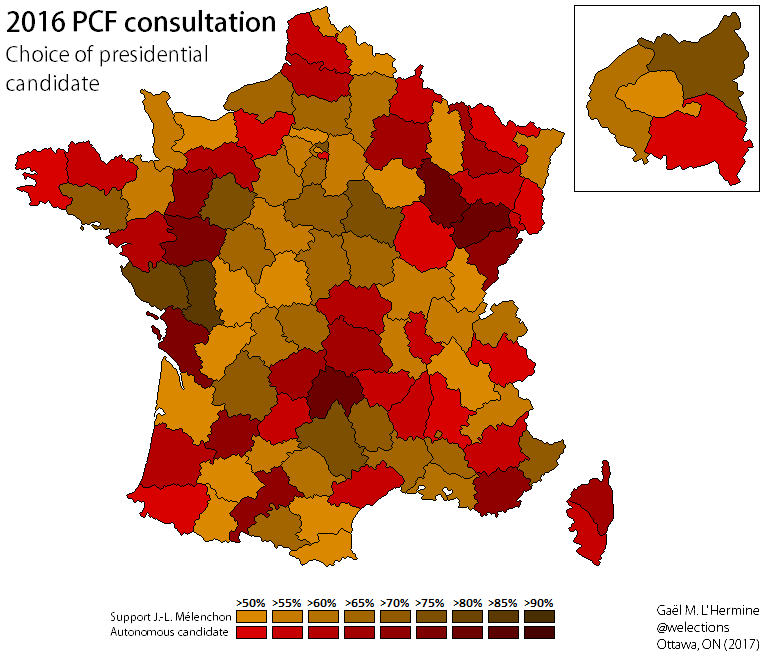 In June 2011, the PCF national conference voted 416 to 238 (63.6% to 36.4%) in favour of the leadership’s resolution supporting the FG and Mélenchon’s candidacy. Two weeks later, in a nominating primary open to dues-paying PCF members, Mélenchon won 59.1% of the vote against 36.8% for the popular rural Puy-de-Dôme deputy André Chassaigne and 4.1% for orthodox (anti-FG) national council member Emmanuel Dang Tran. Mélenchon began the 2012 campaign with 5-8% in the polls, but he rose quickly in the polls during the ‘real’ campaign in March and April 2012, attracting growing media attention and gathering very large crowds at his rallies (up to 120,000 people in Paris and Marseille). His charisma and appealing rhetorical style made him popular, particularly on the left, and he became the phenomenon of the late campaign. Mélenchon attacked Hollande as a ‘soft leftist’ – or, in his colourful speech, a “paddle boat captain” (capitaine de pédalo). He carried a radical left platform which included, among other ideas, a constituent assembly for a Sixth Republic, withdrawal from NATO, repeal of the Lisbon Treaty, nationalization of utilities, legalization of undocumented immigrants, banning market-based dismissals, a maximum salary, an increase in the minimum wage, increased capital gains and wealth taxes and a new environmentally-friendly productive model. Mélenchon rose up to 15-17% in the polls, and a third place finish seemed to be on the cards. In the first round, Mélenchon finished fourth with 11.1% of the vote, falling short of the expectations created by the campaign even if it was the best result for a communist-affiliated candidate since Marchais in 1981. He unconditionally endorsed Hollande, although without explicitly citing his name. During the presidential campaign, Mélenchon became FN candidate Marine Le Pen’s arch-nemesis – the two, lazily identified by the media as ‘populists’ or ‘the extremes’, repeatedly clashed on TV and it was clear that they hated one another. For the legislative elections, Mélenchon decided to challenge his enemy directly on ‘her’ land – in the Pas-de-Calais’ 11th constituency, with the hope that his ‘big personality’ and ‘anti-Le Pen’ media image would overwhelm the carpetbagger label he got attached to himself by deciding to run in a constituency in which he had never lived. However, Mélenchon was defeated by the first round, winning 21.5% of the vote against 23.7% for the PS candidate (who was a local) and 42.3% for Marine Le Pen. The result was a humiliation for a prideful man. The legislative elections were a bitter disappointment for the FG as a whole. 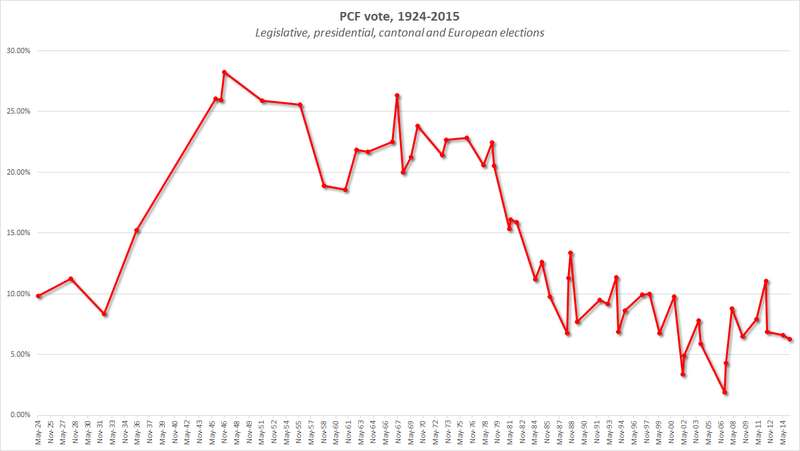 In the wake of Mélenchon’s strong performance in the presidential election, the FG hoped that the momentum he had created would carry through to the legislative elections – and stop the PCF’s parliamentary decline (-20 seats in a decade). Although the FG improved on the PCF’s 2007 result, winning 6.9%, it fell far below Mélenchon’s performance just two months earlier (both in terms of actual votes and percentages). Squeezed by the now-typical post-election ‘confirmation’ of the incoming presidential majority – the victorious PS – several FG incumbents were unexpectedly outpolled by PS candidates in the first round. In the second round, the FG won only 10 seats, including 7 for the PCF which won its lowest seat count in its history (1958, 1932: 10 seats). The FG’s very poor performance in the 2012 legislative elections rekindled tensions between Mélenchon and the PCF, who drew different conclusions from the results and also began adopting contradictory attitudes and strategies towards the new Hollande government. These tensions were made evident during the 2014 municipal elections, resembling those seen in the 2010 regional elections – the PG, with nothing to lose, wanting independent FG lists in every major city, while the PCF, desperate to protect and save its last major asset – ‘municipal communism’ and its hundreds of mayors and thousands of municipal councillors – seeking first round alliances with the PS in most major cities. The most contentious case was Paris, where local PCF members voted – 57% to 43 – in favour of a first round alliance with the PS, a result which Mélenchon called “deplorable” and an “odious betrayal”. The PG, supported by smaller radical left groupings, chose to run independent lists in the first round, led by Danielle Simonnet. In other cities – like Lyon, Marseille and Lille – the FG held together; in some cities, like Grenoble and Rennes, where the PCF allied with the PS instead, the PG formed alliances with EELV (and/or sometimes the far-left NPA as well). Mélenchon, who had at the first tried to downplay the divisions in the FG, later said that the Communists had abandoned him in a number of cities (note the use of the first person – even if Mélenchon was not a candidate anywhere – revealing his self-centred view of his politics). In Grenoble, the EELV-PG list defeated the PS-PCF list in the second round, an historic victory for a ‘red-green’ coalition to the left of the PS which the PG (and EELV’s left) hoped would serve as a favourable precedent. For the PCF, despite regaining Aubervilliers and Montreuil (two iconic ‘red belt’ strongholds lost in 2008), the results were bad – a net loss of over 50 cities and towns, including traditional strongholds like Saint-Ouen, Bagnolet, Bobigny and Le Blanc-Mesnil. In the European elections a few months later, the FG stayed together – but, as explained above, that’s easier to do (and less risky) in EP elections. Once again, the results were a disappointment for the FG, which only further crystallized divisions between the PG and PCF. The FG won 6.6% of the vote and 4 seats (-1). Despite the PS’ rout (14%) because of Hollande and the government’s massive unpopularity (including on the left), the radical left completely failed to benefit. France formed a startling contrast with Greece or Spain, where radical left parties – Syriza and Podemos – did very well. Within the moribund FG, nobody wanted to take responsibility. Mélenchon blamed the PCF for its confusing and inconsistent strategies (allying with the PS in the local elections). Mélenchon’s confrontational opposition to the Hollande government and the PS – built around the idea of “two irreconciliable lefts” – divided not only the FG but even Mélenchon’s PG. The PCF was in opposition to the government, but it was very skeptical of Mélenchon’s vociferous ‘burning bridges’ – the PCF, by its history and political strategies over the past 20+ years, has retained sympathy for the old ideas of the ‘union of the left’ or ‘plural left’ and has therefore been unwilling to consider the PS as a political enemy like all others. The PG’s sole deputy after 2012 – Marc Dolez – left the party in December 2012, opposed to Mélenchon’s ‘irreconciliable differences’ strategy which he argued was confining the FG to the dogmatic and sectarian far-left. Mélenchon’s personality – charismatic and caustic but also abrasive, curt and egotistical – also made him unpopular with the general public, who generally aren’t fond of in-your-face loudmouths outside of election seasons (his unfavourables in the Ipsos barometer oscillated between 55% and 60% between 2014 and 2016, with only 28-34% favourables). VoteWatch.eu ranks Mélenchon as the ninth least active of 74 French MEPs in the current parliamentary term (since 2014), participating in 82% of roll-call votes, and the website’s additional data also shows that, besides over 900 ‘speeches’ and 38 questions, Mélenchon is rather inactive otherwise – no reports or opinion as a rapporteur since 2014. Mélenchon loudly criticized the website, claiming that it was financed by a hodgepodge of lobbies, ‘social democrats’ and George Soros, and instead pointed to an alternative website, MEPranking – though that website too now ranks him as quite inactive (593/747) overall and on basically everything except ‘speeches’ (where he is 41st). The EP allows ‘speeches’ to be either oral or in writing, and, lo and behold, Mélenchon has been a very prolific writer but not speaker. At other times, Mélenchon claimed that he was inactive because he felt ‘more useful’ in other settings and doing other things, like participating in strikes or demonstrations (a shoddy excuse which would probably get you fired from most jobs where you don’t show up!). Mélenchon, increasingly fed up with the PCF, began taking his distances from the FG and focusing entirely on his 2017 presidential candidacy. As a result, the FG appeared even more divided in the 2015 departmental and regional elections. In the departmental elections, which always see a large variety of local alliances, the PCF and/or FG either went alone (in most cases), in alliance with the PS or – particularly for the PG – with EELV, trying to repeat the 2014 success of the ‘red-green’ coalition of Grenoble. Once again, the radical left’s results were poor, paying the bill for the left’s unpopularity in general (as well as its divisions): between 6.6% and 8.9% depending on how results are calculated, with around 150 seats for the FG and its individual components. In the regional elections, the FG was united in 7 regions (out of 13), ran in alliance with EELV in two while the PG formed separate alliances with EELV competing against separate PCF lists in two regions. Nationally, the FG alone won 4.1%, EELV-FG lists won 1.5% and EELV-PG lists won 1.3% – so a total of 6.9% for the radical left across the country, another mediocre performance. The FG was over 10% in only one region (where it was allied to EELV). Where it could, it merged with the rest of the left. In the second round, the PCF won only 29 regional councillors and the rest of the FG won 10 – huge loses compared to 2010, where the radical left had over 100 seats. At its ‘peak’ in 2012, the FG alliance included up to 7 parties and movements besides the PCF and PG, though they were all micro-parties. Three of these parties/movements – Gauche unitaire (Unitary Left, GU), Convergences et alternative (CA) and Gauche anticapitaliste (Anti-capitalist Left, GA) – were minority factions of the far-left LCR/NPA which had split between 2009 and 2012 in disagreement with the far-left party leadership’s opposition to participation in the FG. One other small party, République et socialisme (Republic and Socialism, R&S), was formed by a pro-FG minority faction in the MRC in 2009. The Fédération pour une alternative sociale et écologique (Federation for a Social and Ecological Alternative, FASE) was created in 2008 by PCF refondateurs (the party’s ‘right’) with the fantasy of uniting the ‘alternative left’ under a single roof. It got a few PCF dissidents (like Patrick Braouezec, François Asensi and Jacqueline Fraysse) but nobody else joined, with the minor exception of Marcel Rigout’s Alternative démocratie socialisme (ADS), a Eurocommunist/New Left PCF split-off from the early 1990s which has retained some influence in the Haute-Vienne. The FASE joined the FG in 2011. Les Alternatifs, an old ecosocialist/red green/anti-globalization movement created in 1998, cooperated with the FG on a case-by-case basis but refused to join it in 2011, but changed their mind in 2012. The Hoxhaist Workers’ Communist Party of France (PCOF) participated in the FG between 2011 and 2016, though it’s doubtful anybody noticed them. To weigh more against the bigger PCF and PG, four parties and members of a fifth one – Les Alternatifs, FASE, CA and GA with dissident members of the GU – decided to unite in a single party within the FG in 2013, Ensemble ! (Together!). For whatever strange hard-left reason, GU’s leadership did not dissolve itself into the new party (although most of its members joined anyway) and later decided to merge with the PCF in 2015. Mélenchon didn’t beat around the bush in announcing his presidential candidacy – which everybody saw coming. He officially announced it in February 2016. Whereas in 2012 Mélenchon had ‘played nice’ – placing his candidacy within a more traditional partisan logic (with the FG and its members), he launched his 2017 candidacy outside the traditional political parties and alliances, officially because he considers them outdated and too distant from democracy and citizens. Unofficially, Mélenchon had had enough of being entangled in the radical left’s stereotypical narcissism of small differences or being hostage to the PCF’s whims, and wanted to back his political ambitions with a movement explicitly structured around him and his ideas. In July 2016, Mélenchon unilaterally declared that the FG was dead, a conclusion which both the PCF and Ensemble ! disagreed with (but Mélenchon doesn’t ask for opinions). In February 2016, Mélenchon launched his own movement, La France insoumise (FI). The French word insoumis is difficult to translate to English, but may roughly translate as ‘rebellious’, ‘disobedient’, ‘untamed’, ‘unbowed’ or ‘unsubmissive’ – you get the general point. The party’s logo is the lowercase Greek letter phi (φ) – as Mélenchon explained, phi is pronounced ‘fi’ in Greek, a language which he also associated with democracy. FI claims that it is not a political party (although it is one for legal purposes) but rather a participative citizen movement, built around a participative online platform open to all supporters, who may freely create local committees/support groups or organize events (including in foreign countries). Unlike political parties, FI has no no dues-paying members but only supporters who register or sign up online (no fee required); these supporters are known as the insoumis and FI claims that it currently has nearly 600,000 insoumis, a number which grew exponentially during Mélenchon’s campaign from 30,000 in February 2016 to over 430,000 on the eve of the first round in April 2017. FI’s website recommends that supporters may ‘act’ by hosting or participating in events or local meetings, donating money (the movement is mostly financed by supporters’ small contributions) but also by ‘acting’ on Twitter, Facebook, commenting online, blogging and even ‘proposing videos and music’ or ‘taking pictures and videos’. Like Italy’s M5S, the insoumis are regularly called upon to participate in online votes about the movement’s orientation or to approve decisions. FI claimed inspiration from Bernie Sanders, Podemos in Spain and Rafael Correa’s citizen revolution (revolución ciudadana) in Ecuador. For critics, the actual style and organization of FI around Mélenchon’s persona made it more of a populist demagogue’s cult following. Also like M5S and Beppe Grillo in Italy, Mélenchon’s campaign made heavy use of the internet and social media. Compared to the United States or some Latin American countries, French politicians have been slow at catching up to online campaigning and social media platforms like Twitter. Mélenchon gained a large following on his YouTube channel with his weekly vlog (La Revue de la semaine), which he started in October 2016 and in which he talks about various news topics for about 20-30 minutes from his perspective. Mélenchon’s YouTube channel currently has nearly 370,000 subscribers, which is much more than what any of the candidates’ channels had (max. 24,000) and more than both Donald Trump and Hillary Clinton’s YouTube channels. In February, he organized two simultaneous rallies in Paris and Lyon, appearing live as a hologram in the other city. Online, his supporters created a video game, Fiscal Kombat, in which Mélenchon fights the ‘oligarchs’. His young supporters were also very active online and on social media, organizing support or popularizing meme slogans like Can’t stenchon the Mélenchon. Mélenchon has a frank and informal rhetorical style, which is quite rare for French politicians – (in)famous for their lyrical, formal and pretentious ‘wooden language’ filled with historical and literary references. Mélenchon is therefore seen as refreshing in his language, explaining his platform or commenting on events in a fairly straightforward and understandable tone; at the same time, he’s been accused of being a populist or a demagogue. Mélenchon chose to campaign using online platforms and social media in part because of his tempestuous relation with the mainstream media, a very frequent target of his rants and insults. Not unlike Rafael Correa, Mélenchon has in the past referred to individual journalists who annoyed him as ‘bastards’, ‘dumbasses’, ‘vermin’, ‘idiots’, called some of their publications ‘fascist’ (L’Express) or influenced by the CIA (Le Monde) and considered what they wrote to be ‘crap’ (L’Express). At the same time, Mélenchon’s rants against the mainstream media make him popular with his anti-establishment left-wing base (who consider the media to be subservient to the ‘system’), yet he also uses the ‘hated’ mass media to get his message across. Mélenchon’s supporters claim that the media is biased against him – and the radical left in general – and portrays him or his ideas unfairly or dishonestly. FI’s website has a ‘detox’ (or spin) section to respond to critical media coverage. It is true that the media sometimes focused on more trivial aspects of Mélenchon’s views and campaigns (like hounding him for his sympathies with Cuba and Venezuela), but they do that with every candidate regardless. Mélenchon was nastier and angrier in his past campaigns, a poor man’s George Marchais (former PCF leader famous for his sarcastic humour, clashes with journalists and bombast) and could come off as rude and unpleasant. He was calmer (and more pleasant) in 2017, tempering his rants and insults against opponents and critics and coming off as friendlier (and funnier). In addition, while his 2012 campaign was a more typical radical left campaign – red flags, red campaign posters, L’Internationale and appeals to the ‘the people of the left’ (le peuple de gauche), his 2017 campaign was less overtly radical left – French tricolours, blue sky background, La Marseillaise and a broad-based populist appeal to ‘the people’ or ‘the force of the people’ (the latter was the campaign’s slogan). In October 2016, RTL reported that Mélenchon wanted to stop singing L’Internationale at the end of his rallies (because many supporters didn’t know the words). The PCF took poorly to Mélenchon’s new campaign strategy and movement, irritated by his behaviour and invectives against the party. PCF national secretary Pierre Laurent and his predecessor, Marie-George Buffet, wanted the party to support Mélenchon’s candidacy, but many party cadres and members, led by André Chassaigne either wanted the party to have its own candidate (Chassaigne offered himself) or support another left-wing candidate (like Arnaud Montebourg). In November 2016, the over 500 delegates at the national conference voted 274 to 218 in favour of having an autonomous PCF candidate, defeating the position supported by Pierre Laurent (‘critical’ support to Mélenchon). The issue was to be settled by dues-paying members – 56,595 were registered – three weeks later. The PCF was faced with an impossible choice. On the one hand, the party had grown exasperated with Mélenchon and what they judged to be a sectarian (and cultist) strategy which was clearly aimed at undermining and eventually finishing off the PCF. Mélenchon had already announced that his FI would have candidates everywhere in the legislative elections, competing separately against PCF candidates, something which was completely unacceptable to the Communists, dependent on the public financing determined by a party’s results in the legislative elections. Those who wanted the PCF to have its own autonomous candidate argued that the party would not survive another election without a presidential candidate of its own, particularly if it was to support a candidate whose goal was to dispose of the old PCF and take over leadership of the radical left for himself (without pesky Communists). Yet, the party also realized that having a candidate of its own (competing against a well-known, charismatic and increasingly popular Mélenchon) was suicidal, particularly given antecedents (1.9% in 2007). At the end of November, PCF members (41k voted) voted 53.5% in favour of supporting Mélenchon’s candidacy. The party was divided, but took what was perhaps for them the least worst decision. Ensemble ! also voted to support Mélenchon’s candidacy, although about a quarter of the small party’s members were opposed. Both PCF and Ensemble ! claimed that the FG still existed (and both parties still used the FG logo) and decided to run their own autonomous campaigns, separate from FI, with their own leaflets and posters. Despite the PCF’s decision to endorse Mélenchon, tensions and disagreements between the candidate and the party remained obvious throughout the campaign. The issue of the legislative elections remained unresolved throughout the entirety of the presidential campaign, distressing the PCF. To signal its discontent, the PCF used the only trump card it still has – its network of local elected officials – and, according to Mélenchon, withheld its signatures/endorsements until the last minute. A week before the deadline for candidates to submit their 500 signatures, Mélenchon had 432 – less than some minor candidates – and he was angry at the Communists. Mélenchon finally got 805 signatures (though only 3 PCF deputies signed for him). Pierre Laurent reminded him that, without the Communists, he wouldn’t be a candidate while other Communists, in private, complained of Mélenchon’s arrogance (“I don’t need anyone”, mocking his trust in his big YouTube fanbase). Mélenchon was supported by some left-wing EELV dissidents who disagreed with the party’s February 2017 decision to drop out and endorse PS candidate Benoît Hamon. EELV deputy Sergio Coronado (representing French expats in Latin America) and about 25 other greens published a column in March 2017 endorsing Mélenchon, arguing that the green left needed to emancipate itself from the PS and that Hamon’s environmentalism was “recent and incoherent”. Éric Piolle, the EELV mayor of Grenoble elected in alliance with the PG, also endorsed Mélenchon. Smaller left-wing and far-left parties and movements, many of them in overseas regions (Guadeloupe, Réunion), also endorsed Mélenchon. Prominent foreigners like Pamela Anderson, Danny Glover, Mark Ruffalo, Oliver Stone, Noam Chomsky, Naomi Klein, Pablo Iglesias and José ‘Pepe’ Mujica also endorsed Mélenchon. Mélenchon’s platform, L’avenir en commun (The future in common/The future together), was released as a book in December 2016. It was costed and debated in February 2017 during a 5-hour live broadcast streamed on YouTube, getting over 345,000 views in less than 15 days. The platform was elaborated by Charlotte Girard, a jurist and Jacques Généreux, a left-wing economist and founding member of the PG in 2008. The platform is organized around seven axes with 83 issues: the Sixth Republic, the economy (‘protect and share’), ecological planning, withdrawing from European treaties, France’s national sovereignty, human progress and France ‘at the frontiers of humanity’. Mélenchon’s first promise was to elect a constituent assembly to draft the constitution of the Sixth Republic. Inspired by past constituent processes in Latin American countries like Ecuador, Mélenchon offered a fairly detailed road map: holding a referendum to convene a constituent assembly in June 2017; an assembly then composed of elected member and citizens drawn by lots to diversify backgrounds. No past or present parliamentarians would be allowed to run, and no member of the constituent assembly would be allowed to run for any political office he/she created. The constituent assembly would serve 2 years and their draft constitution would be submitted to referendum in 2020. Mélenchon said he would automatically leave office as soon as the Sixth Republic came into being. Mélenchon – and much of the French radical left – are opposed to the current political system, which they consider to be a “presidential monarchy” in which the president has too much power. Instead, they support a parliamentary system of government with a unicameral legislature elected by proportional representation with term limits, citizen initiative and recall referendums and approval of all constitutional amendments or new EU treaties by referendum. He also proposed compulsory voting with the voting age lowered to 16, with voting rights for non-EU foreigners in local elections and recognition of blank votes as valid votes. Mélenchon proposed a fairly substantial overhaul of the judiciary – not only recruiting additional staff in courts and prisons but also replacing the Superior Council of the Judiciary (which formulates recommendations on judicial appointments and is the disciplinary body for judges) and the Court of Justice of the Republic (which tries members of the government) and creating a common supreme court by merging the Court of Cassation (supreme court for criminal and civil matters) and the judicial powers of the Council of State (supreme administrative court). Mélenchon’s constitution would be very socially liberal with constitutional recognition of the right to contraception, abortion, death with dignity and the principle of non-commodification of the human body. ‘Common goods’ – air, water, nutrition, health, energy, the living and money – would be constitutionalized and property rights subject to the general interest. Mélenchon’s republicanism is rooted in historical references to the French Revolution, the construction of the modern French nation-state during the Third Republic (a laïque, Jacobin and civic nationalist model) and the struggles of the French labour and socialist movement (references to Jean Jaurès) – a French socialist republican vision which contrasts with the internationalism and class struggle of the communist movement. Mélenchon said he would repeal the concordat in Alsace-Moselle (where the 1905 law does not apply and ministers are paid by the state), guarantee freedom of conscience and refuse all public funding for the construction of religious or spiritual buildings. Mélenchon’s republican vision, rooted as it is in the nation-building legacy of the Third Republic, is quite hostile to regional and minority languages and cultures in France, which people of his political persuasion associate with separatism and reactionary politics. He opposed ratification of the European Charter for Regional or Minority Languages, had criticized bilingual schools in Brittany and was extremely critical of the 2013 Bonnets rouges movement in Brittany (which had very clear regionalist orientations and leadership, with a cross-class backing), which he called a ‘regionalist stupidity’ and insultingly claimed that protesters were “slaves demonstrating for the rights of their masters”. Mélenchon’s campaign targeted the political ‘caste’ and ‘oligarchy’, promising to ‘sweep away the oligarchy and abolish caste privileges’ – a rhetoric similar to Andrés Manuel López Obrador’s attacks on the ‘mafias of power’ in Mexico. By ‘caste privileges’, he mostly mean impunity and protections for corrupt politicians and lobbyists; he promised lifetime political ineligibility for anyone convicted of corruption, banning lobbyists from physically entering Parliament, forcing elected officials to publish their asset declaration and allowing the tax services to open judicial tax fraud investigations on their own without ministerial authorization. Fitting with his criticism of the mainstream media, Mélenchon’s platform proposed the adoption of an anti-concentration media law (like in Ecuador? ), the creation of a national media council to provide ‘a real civic counter-power guaranteeing pluralism’ and protecting journalists’ sources and independence. The platform advocated substantial changes to terrorism, crime and security policies – in general terms, a reorientation away from ‘repressive’ law-and-order strategies. It proposed an evaluation of existing security and anti-terrorism legislation, moving out of the state of emergency, community policing, ending target-based security polices, prioritizing white collar crimes and trafficking networks (drugs, prostitution, weapons, humans) and non-prison alternative sentences. It also sought to create a paid (minimum wage) nine-month ‘compulsory civic service’ for men and women under the age of 25 including basic military training and general interest tasks like public safety, environmental protection and relief. Mélenchon promised to repeal the El Khomri law, increase the minimum wage by €175, lower the retirement age back to 60 (and redue the number of contribution years for full benefits from 41.5/43 to 40), increase small pensions by €200, reduce and share working time (rigid enforcement of the 35 hour workweek and favouring a 4-day 32-hour workweek), create a sixth week of paid holidays for all employees, limit precarious contracts (and make permanent contracts the norm) and to fight tax evasion and tax havens (citizenship-based taxation, banning French banks from operating in tax havens). Attacking the ‘economic looting of the nation’, he vowed to undertake an audit of all privatizations in the past 30 years, re-nationalize certain sectors (energy, transports), declare a moratorium on PPPs and to launch an inquiry on industrial and economic ‘looting’ (Alcatel, Alstom, EADS). He proposed a series of protectionist measures including emergency anti-dumping regulations in strategic sectors, increased tariffs on imports from countries with poor social rights, leaving the WTO (with the UNCTAD as the ‘legitimate body’ to organize international trade rather than the G7/20 or IMF/WTO) and opposition to TTIP and CETA. Mélenchon was also, unsurprisingly, intensely critical of ‘big finance’. He promised to separate investment and retail banking, control capital flows, impose a ‘real’ tax on financial transactions, ban toxic assets, modulate shareholders’ voting rights on basis of the length of their engagement with the company, a complete reevaluation of public support and tax benefits to companies, ban companies from borrowing to distribute dividends and to ban market-based dismissals (layoffs to increase shareholders’ profits without any economic justifications, the French term licenciement boursier is a pejorative politicized term coined by the left). On workers’ rights, Mélenchon’s platform included giving work councils a ‘suspensive veto’ on layoffs and employees a ‘vote of no confidence’ in CEOs or strategic projects. He also supported capping CEO pay (1:20 pay gap). He proposed a ‘fiscal revolution’: taxing capital income at the same levels as work income, a very progressive income tax with 14 rather than 5 brackets, a maximum income (100% tax) of €400,000 annually, abolishing unfair tax loopholes, progressive corporate tax rates, strengthening the ISF, increasing inheritance taxes on large estates with a maximum inheritance level and lowering the VAT on essential goods. Mélenchon argued that banning unfair market-based dismissals, repealing the El Khomri law, protecting workers’ rights and going after ‘big finance’ would help create the 3 million jobs he promised. He proposed a set of interventionist policies to create (greener) jobs and reindustrialize France including over €140 billion in new investments (including €41 billion from scrapping the CICE and ‘responsibility pact’) and the creation of a public ‘banking pole’ (from socializing commercial banks) to finance SMEs. The platform also included a pledge to build 200,000 social housing units over 5 years, a universal rent guarantee, personalized anti-poverty plans and free basic utilities. The third axis of L’avenir en commun was responding to the ‘environmental emergency’ through ‘environmental planning’ and the ‘environmental [energy] transition’ – in detail: 100% of renewable energies by 2050, withdrawal from nuclear energy, a green renovation plan, re-developing rail transport, carbon contribution on freight transport (to support short-distance cargo and local production), opposition to GMOs, banning dangerous pesticides, eradicating animal cruelty, developing bio-agriculture and stopping urban sprawl. FI argues that the current European Union is only a common market of peoples submitted to the dictatorship of banks and finance. Mélenchon said he would withdraw from European treaties (which ‘impose austerity’) including the European Fiscal Compact‘s rules on deficits and the posted workers directive. Mélenchon had a ‘plan A’ and ‘plan B’ to withdraw from EU treaties: plan A was a “concerted exit from EU treaties by all willing countries and the renegotiation of new treaties” and plan B was a unilateral French exit from EU treaties. Among the things Mélenchon wanted to see in new treaties were the end of the ECB’s independence, a devaluation of the Euro, control of ‘big finance’, eventual debt moratoriums, an end to service liberalization (rail, energy, telecommunications), European protectionism (no free trade), an end to internal dumping, a new CAP and a new GHG reduction strategy. In case of a plan B, France would stop its budgetary contributions, regain control of credit and banking policy (and consider an ‘alternative monetary system’) and border controls on capital and merchandise. A renegotiated treaty would have been submitted to referendum and Mélenchon said he would have resigned if he lost the referendum. Mélenchon’s foreign policy ideas were based, ostensibly, on ‘peace’ and an independent foreign and military policy outside of NATO, the IMF, WTO and World Bank with a new alliance of non-aligned countries within the UN. His platform’s proposal included: asylum for Edward Snowden and Julian Assange, recognition of Palestine (and two-state solution), codevelopment with developing countries, joining ALBA and increased cooperation with Mediterranean countries. His ideas for peace in Syria were a bit pie-in-the-sky (ceasefire, free and fair elections, territorial integrity under UN supervision). To his critics but also several journalists and academics, Mélenchon is pro-Russian and complacent towards Vladimir Putin, even if he has repeatedly denied any admiration or political support for Putin. However, Mélenchon implicitly supported Russia’s annexation of the Crimea, supported the Russian intervention in Syria (while disapproving of American airstrikes under both Obama and Trump), criticized François Hollande’s hostile attitude towards Putin and said in 2015 that he refused to participate in the “overexcited chorus of people” hoping for a conflict with Russia. His past comments about Cuba (‘not a dictatorship’) or Hugo Chávez have also been controversial, with the right-wing newspaper Le Figaro calling him the ‘French Chávez’ in a front page headline during the campaign. However much he has been inspired by Cuba, Ecuador or Venezuela, Mélenchon’s 2017 campaign was – understandably, given the crisis in Venezuela – more reticent to draw on chavista ideology, and he considered the media’s attempts to paint him as a castrochavista to be silly Red Scare tactics. Some of Mélenchon’s critics on the left said that his views on immigration and refugees had shifted, becoming tougher, since 2012 with the European migrant crisis. In 2012, the candidate had said that immigrants weren’t a problem, vowed to scrupulously respect international obligations for asylum seekers and considered ‘zero immigration’ to be a divisive myth. In 2017, although his platform still opposed the ‘clash of civilizations’ doctrine and supported the legalization of undocumented migrants, he now spoke of “fighting against the causes of migrations” – stopping wars, ending unequal trade agreements etc., but in the meantime wasn’t overly enthusiastic about welcoming refugees in Europe (he did support improving rescue capacities in the Mediterranean and ‘reaffirming’ the right of asylum). Some were disappointed to hear that Mélenchon’s attacks on social dumping seemed to be aimed more that the posted workers than at employers who practice social dumping. FI made a realistic calculation: having far-left positions on immigration, which don’t play well at all, would have been political suicide, and Mélenchon was unwilling to risk that battle. The other major aspect of L’avenir en commun was ‘human progress’. Substantive promises on this axis included: full reimbursement of prescribed healthcare (dental, optical and auditory), filling medical deserts with a corps of public GPs, reduction of healthcare costs (co-pays, extra billing), legalization of marijuana, extending mandatory schooling to 3-18, hiring 60,000 new teachers (and increasing their pay), repealing most recent education and university reforms and defending free public education. With all new measures and promises, L’avenir en commun would have increased spending by €173 billion, which they claimed would be paid for with the tax increases on the rich, crackdown on tax evasion, closing loopholes and a vaguer idealistic ‘economic recovery’. Mélenchon’s platform was a very left-wing and anti-establishment/anti-system document which advocated a near-complete overhaul of everything: institutions, economics, social policy, environmental policies, foreign policy, European relations, security and so forth. It mixed fairly ‘typical’ proposals of the French radical left with some more ‘Mélenchonian’ ideas, all with a very heavy dose of left-wing populism which targeted the ‘political caste’, economic liberalism, ‘big finance’, the EU, ‘thuggish bosses’ (patrons voyous), the far-right and ‘communitarians’ undermining republican values. After Benoît Hamon won the PS primary in January 2017 on a left-wing, anti-government platform, left-wingers in France and abroad idealistically hoped that Hamon and Mélenchon could come to an agreement and ‘unite the left’, given that they agreed on many issues. A Hamon-Mélenchon ‘union of the left’ was never a serious, realistic possibility and was mostly used by Hamon’s early campaign in February as political theatrics to paint Mélenchon as an ‘unreasonable’ divider (things changed once Hamon became the weaker of the two). The presidential election is the most important election in France, in which no party or major candidate would willingly bow out to endorse another major party or candidate. The other issue, of course, was – who would drop out and who would be the candidate until the end? There was no easy way to figure that out – no way to hold a new primary for the entire left, for example – and neither Hamon or Mélenchon were willing to sacrifice themselves or their candidacies for the sake of a nebulous ‘united left’. Hamon had won the primary despite lacking the support of the party establishment and parliamentary caucus, and was the weak candidate of a weakened and divided party. Him withdrawing from the race to endorse Mélenchon, who the PS has repeatedly attacked as a dangerous populist or demagogue for years, would have led to the PS’ explosion before April. Mélenchon, even overlooking his arrogance or egocentricity, had no reason to ally with a party as divided, weakened and unpopular as the PS (regardless of the candidate’s name). In fact, allying with the PS after having attacked the party for years would certainly have stripped Mélenchon of much of his populist, anti-system (‘anti-caste’) legitimacy and credibility. In addition to these strategical and personal differences, there were still some ideological differences between the two. Whether these ideological differences were irreconcilable differences or merely differing perspectives hiding agreement on principles is another matter. Hamon and Mélenchon differed on foreign policy (Mélenchon as allegedly pro-Russia/Putin, Hamon as anti-Russia; Mélenchon’s more radical independent foreign policy including withdrawal from all major international organizations except the UN and joining the chavista ALBA), Europe (Mélenchon opening the door to ‘Frexit’ and leaving the Euro; Hamon just wanting ‘democratization’), immigration, universal basic income (Mélenchon called Hamon’s landmark idea a poverty trap) and on some economic issues.